Originally published in the WHO Goodwill Ambassador’s Newsletter for the Elimination of Leprosy, Issue No. 41 (December 2009). The information was correct and current at the time of publication. Maya Prakash Ranaware is helping to improve conditions in Maharashtra’s colonies. When India’s National Forum of persons affected by leprosy was established in 2005, it created a framework for realizing the potential of people like Maya Prakash Ranaware. In 2006, Maya was selected as a National Forum state leader for Maharashtra. As a state leader, Maya represents the interests of some of Maharashtra’s 58 self-settled leprosy colonies. Hard working and self motivated, she was chosen because of her leadership qualities and close association with affected persons and families in different colonies — as well as her zeal to improve their quality of life. Maya’s responsibilities include visiting 12 colonies in the southwestern part of the state, assessing their needs, informing them about National Forum activities, developing networks and forming self-help groups. She lives with her husband and two daughters in Swadhar Nagar Shendapark Colony in Kolhapur. Swadhar Nagar is a self-settled leprosy colony that is home to 125 families. Maya is the child of a leprosy-affected mother and was born and brought up in the colony. Now 30 years old, she was diagnosed with leprosy at the age of six, and completed her treatment in 1987. However, her family’s economic circumstances meant she could not finish her education. Her mother was illiterate and was forced to beg. Even Maya had to beg once a week. She also worked as an agricultural laborer so that her family could survive. Maya met her husband in 1996. Like her, he is a person affected by leprosy. The couple’s children, aged 12 and 10, go to a local school in the city. 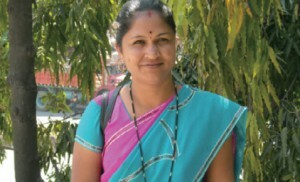 In addition to her work with the National Forum, Maya has established a women’s association and three women’s self-help groups in her community. The groups offer family counseling, vocational training in tailoring and soap-making and are involved in environmental protection and AIDS awareness activities. With the help of various sponsors, they also provide educational assistance to children in the form of textbooks, notebooks and uniforms. Group members attach particular importance to family planning and Maya says they have all been motivated to undergo a family planning operation. As a result, among the younger generation living in the colony, two-child families are the norm. Maya and colony members have to struggle very hard. She has organized morchas, which are meetings with local authorities, and she never hesitates to discuss the problems of the colonies with ministers and politicians. She never hesitates to discuss the problems of the colonies with ministers and politicians. As a result of her tireless efforts in Swadhar Nagar, Maya has helped people affected by leprosy to obtain ration cards, Below the Poverty Line (BPL) cards, financial aid under the Sanjay Gandhi Niradhar Yojana (government assistance scheme for the very poor), and housing under schemes such as the Valmiki Ambedkar Awas Yojana. Under these programs, central and state governments provide financial support to slum dwellers to construct residential housing. So far, 44 persons affected by leprosy have benefited, among them Maya and her family. A further 80 houses have been approved and work on them will commence soon. Maya has already achieved a great deal for persons affected by leprosy, but there is much more she wants to do. Among her goals is to empower colony members by developing a cottage industry to produce thermacol plates, glasses, and bowls. She also wants to see that every child in the colonies goes on to higher education, that the older generation stops begging and that child marriages are prevented.